The implementation of warm-mix asphalt (WMA) is becoming more widespread with a growing number of contractors utilizing various WMA technologies. Early research suggests WMA may be more susceptible to moisture damage than traditional hot-mix asphalt (HMA) mixes. The objectives of this study are to test the binder and mix properties of WMA technologies for both field- and laboratory-produced mixes to determine the performance of WMA compared to traditional HMA. Field- and laboratory-produced mixes were studied. The laboratory-produced mixes compared HMA control mixes with WMA mixes that had the same mix design. The WMA technologies used for the laboratory study were Advera, Sasobit, and Evotherm. The field study tested four WMA field-produced mixes. Each of the four mixes had a corresponding control HMA mix. The WMA technologies used in the field study included: Evotherm 3G/Revix, Sasobit, and Double Barrel Green Foaming. The three main factors for this study were WMA/HMA, moisture-conditioned/not moisture-conditioned, and reheated/not reheated. Mixes were evaluated based on performance tests. 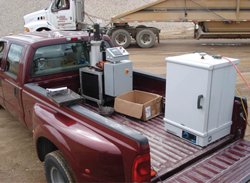 Binder testing was performed to determine the rheological differences between HMA and WMA binders to determine if binder grade requirements change with the addition of WMA additives.